Vancouver Sun news article published on July 14, 2012. A number of mistakes made in the article have been noted with the corrected information. A B.C. 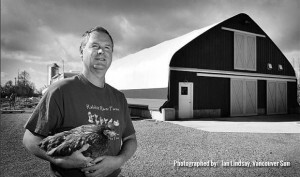 egg farmer is producing Canada’s only white-shelled specialty eggs, a free-range, humanely raised Omega-3. bred for life in battery cages. But Richmond egg farmer Stephen Easterbrook is turning the tables on the table white egg. Rabbit River Farms Omega-3 white eggs are coming to market this month at a retail price that will range upwards of $5.50 a dozen, depending on the store. Rabbit River Omega-3s can be purchased in cartons of all-white eggs or a random mix of white and brown. Many eggs have a tiny piece of ovarian membrane near the yolk, which in brown eggs may absorb pigment left over from the previous egg’s shell. “Both white and brown eggs have the tissue, but in white eggs you can’t really see it because it’s white,” said Easterbrook. Easterbrook tested the notion of free-range Lohmanns on mini-flocks before launching his mixed white and brown commercial flock of 6,000 hens. Life for Rabbit River Free Range Omega-3 Lohmanns is a considerable improvement over life in a cage. The birds are free range, meaning that weather permitting, they have on average eight hours a day of access to the outdoors, an area that totals six acres. Canada’s federal organic standard also stipulates that the hens are free to range, nest, roost, dust bathe and socialize. The hens are fed non-GMO, antibiotic free, all vegetarian grains & legumes, plus ground flax seed and vitamin E to enhance the omega-3 fatty acid and antioxidant content of the eggs they lay. The flock is also certified humane by the B.C. Society for the Prevention of Cruelty to Animals. Rabbit River also produces free-run omega-3 eggs, which are cage-free and barn- raised without outdoor access. Because the hens require less management and training, the eggs are a few cents cheaper.